One of the many delicious meals we had in Syria was Amto Warda’s heartwarming shakriya I say with complete admiration that even though I follow the same method she does, hers just comes infinitely better than mine. If my shakriya is a 5, then Amto Warda’s is a 20. There is no comparison. But, here’s how I do it. For real shakriya, visit Amto Warda in Damascus. Shakriya is the definition of Syrian comfort food. It was one of the first meals Maryam treated me to when we Ameir and I got engaged, and we also had it the night we arrived in Syria for our wedding. After a long day, it’s a treat for Ameir and I to go to his dad’s house and eat big bowls of Fatimah’s shakriya and rice. 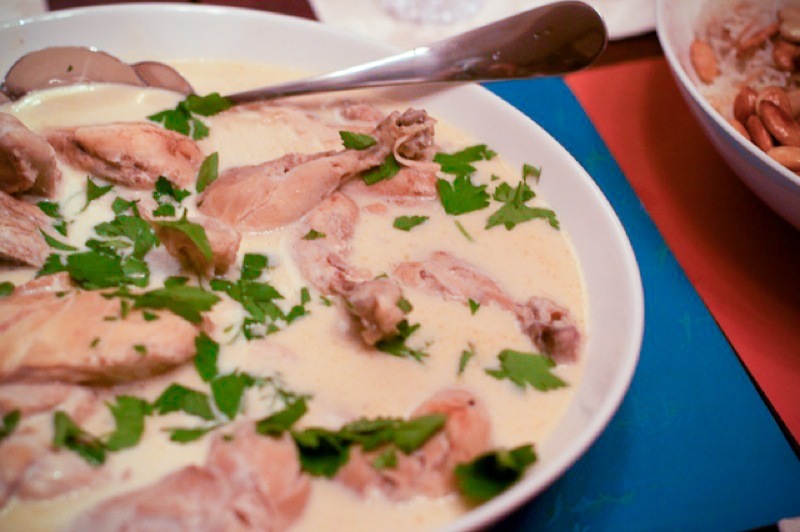 Shakriya is a stew of meat, usually chicken or lamb, in a tangy yogurt sauce. The meat and yogurt are cooked separately, then simmered together. It’s all generously ladled over rice and served with a plate of fresh, flavorful vegetables. 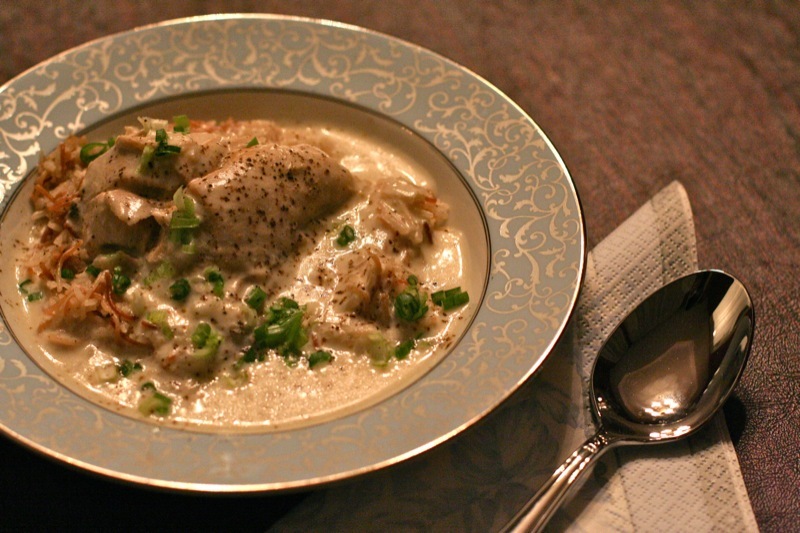 It is perfect for a quiet, cold night, but also elegant enough to serve homestyle to dinner guests. 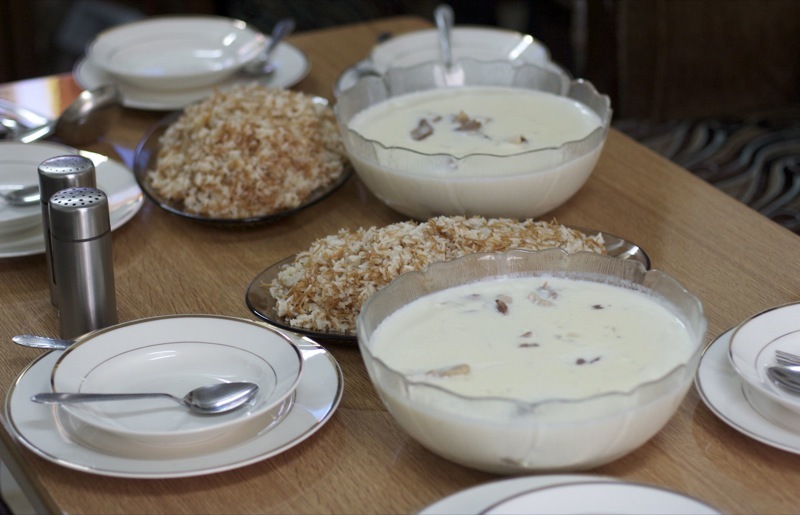 Admittedly, it is a bit tricky at first to learn how to make the yogurt sauce, sometimes called labaniyya. But, once you get the hang of it, it’s easy to whip up. This sauce is also very versatile. You can use it here, in shakriya, or with shish barak (meat and walnut tortellini, but that’s another post) or with fried kibbe. You can jazz it up by adding boiled potatoes or flavoring the yogurt with curry powder, or do it the classic way I’ll show you here. Fatimah and Maryam taught me this, and honestly, I’m probably still not as good as making the yogurt sauce as Aishah (Ameir’s 10 year old sister) is! It’s really worth getting whole milk yogurt for this dish, since it really is all about the yogurt. Ethnic markets, especially Arab or Southeast Asian markets, are a great source for this. Note: I’ve been practicing cutting a whole chicken into parts myself. It takes some effort and courage, but I like the control over the size of the pieces. If you do this, make sure to put the backbone in with the chicken pieces while they’re simmering. Mix all the spices together and sprinkle generously over the chicken pieces, front and back. Heat oil in a deep pot and sear the chicken on both sides, working in batches if you have to. Then, put them all in the pot and pour in enough water to cover the chicken by an inch or so. Bring to a boil, and then let it simmer for 30-45 minutes until the chicken is cooked through. It won’t cook again in the yogurt sauce, just be warmed. What you’re doing is cooking the chicken and also creating a broth to stir into the yogurt sauce. If you get some foam on the top while the broth is simmering, just skim it off. Once your chicken is done, gently take out the pieces, put them in a plate, and cover until you’re ready to put the meal together. Strain the broth through a wire sieve, pour it back into the pot, and simmer for 5-10 minutes until slightly reduced. So, by now, you’re thinking – cooked yogurt sauce? Are you crazy, Taiyyaba? I’m not, really. You can cook almost any liquid dairy (even buttermilk). And if you’ve ever had a true chicken curry or a beef korma, you’ve had cooked yogurt. That being said, cooking this amount of yogurt takes time. You really have to go slowly to stabilize it, and the cornstarch and egg will help too. Start by putting the cornstarch in a bowl and putting a quarter cup of the yogurt in. Mix very well until smooth. Crack in the egg and beat well, and then add the rest of the yogurt in. Whip the whole thing until very smooth. Pour the yogurt mixture into a deep pot and put it on medium to medium-high heat (not high!). Here’s the only hard part (and you can do this while the chicken is cooking): you must continually stir this until the yogurt gets so warm that it is simmering strongly through the stir. This takes about 15 minutes. Keep stirring. Don’t stop. Maryam tells me that you must stir all in one direction, and that you must use a spoon and not a whisk, to avoid curdling the yogurt. I’ve never done it any other way, so I’m gonna go ahead and say that too. Once you see that the yogurt is simmering through the stir, keep stirring for another 10 minutes or so to make sure it’s fully cooked. Add about two cups of broth and simmer until the sauce is thick enough to lightly coat the back of a spoon. It won’t be as thick as pancake batter, but definitely not as watery as broth. Taste for salt, and crack in fresh black pepper. At this point, you can just walk away until you’re ready to serve the meal. The yogurt has stabilized, so it can be reheated any number of times. When it’s time to eat, put the chicken into the yogurt sauce and simmer until the chicken and sauce are warmed through. You could even do this and leave the whole thing in a slow cooker on warm till you’re ready to eat. Serve in deep bowls with simply-cooked rice. In Syria, bowls of fresh vegetables – green peppers, green onions, radishes, a peppery green called flaiflai (which I suspect is a variety of alfalfa) – are a classic accompaniment. I garnish my bowl with parsley and put a lot of fresh cracked pepper on top. If you’re a big fan of garlic try this flavor booster that is usually put over shish barak : heat some oil in a frying pan and throw in a couple of cloves of minced garlic. Let it sizzle for a minute, and then add a handful of chopped parsley. Cook until the parsley is just wilted, about 15-30 seconds, and then pour this flavored oil on top of the shakriya. so. good. I found your blog very randomly in a google search.. I saw the pic and I was drawn in so I started reading this recipe and decided to try it for dinner. I made it tonight.. it took me a long time! lol But it was reeeeeeally yummy. Thanks for sharing. Btw, I love your blog and all the pretty pics. 🙂 What camera do you have? Salam! I made this today and it was soooo good! The directions you’ve given are fail-proof 🙂 Thank you! Wonderful recipe. Actually, flaiflai means peppers, not alfalfa. And how do I know that? My wife is Syrian!